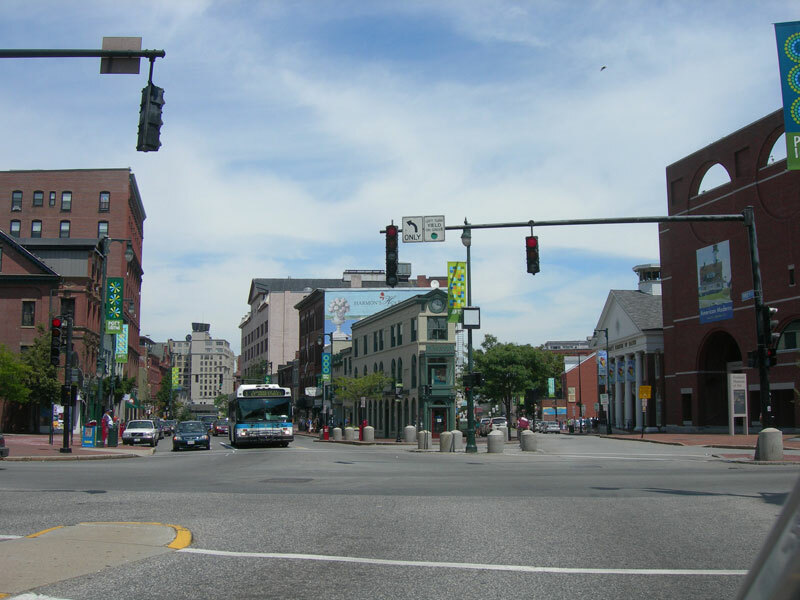 Congress Street is Portland's "Main Street," the peninsula's primary east-west commercial and transportation axis. From the street's beginnings as an access road for farmers bringing their goods to market to its development into a prestigious residential neighborhood and then Portland's commercial and cultural center, the character and role of Congress Street has evolved throughout its history. Extending from High Street to Market Street. Congress Street and High Street. Photo by Flickr user Jimmy Emerson, DVM (CC BY-NC-ND 2.0). The visual character of Congress Street is rich and varied, and the character of the street is one of layered historical development over time. The result is an area with a delightful mix of historical architectural styles from 18th century Colonial and 19th century Federal to 20th century International and 21st century Post Modern, with examples of nearly every significant style of residential, commercial, and civic architecture in between. This eclecticism and layering is the essence of the street's charm. Congress Street is designated as part of the Arts District of Portland. At numerous art galleries, theaters, museums, and schools there are volunteers, tourists, and residents who participate in cultural activities and events, notably the First Friday Art Walk. Managed by the local arts agency Creative Portland, this event attracts thousands downtown each month and features street artists and performers and 50 to 70 venues that are open to the public for free to view art exhibits, performances, and more. 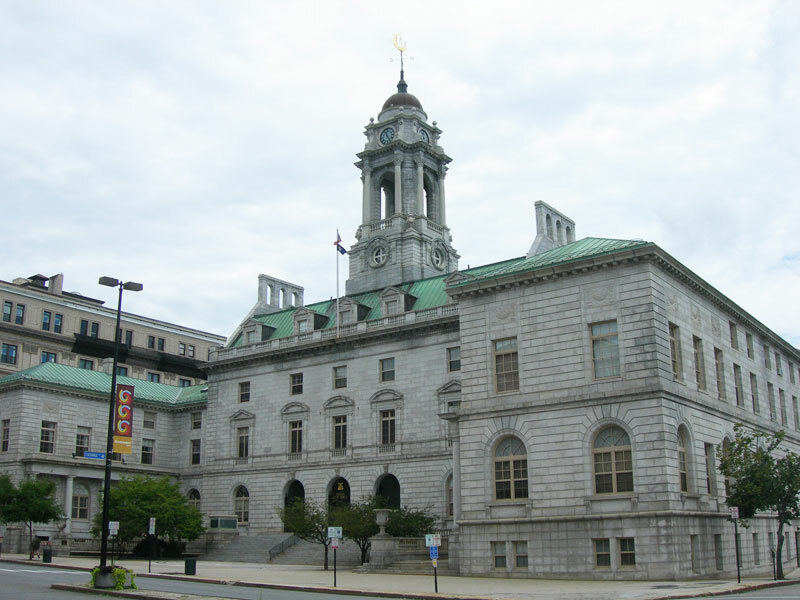 Monument Square, an iconic, pedestrian-only public space, is the site of many local events such as the Farmer's Market. 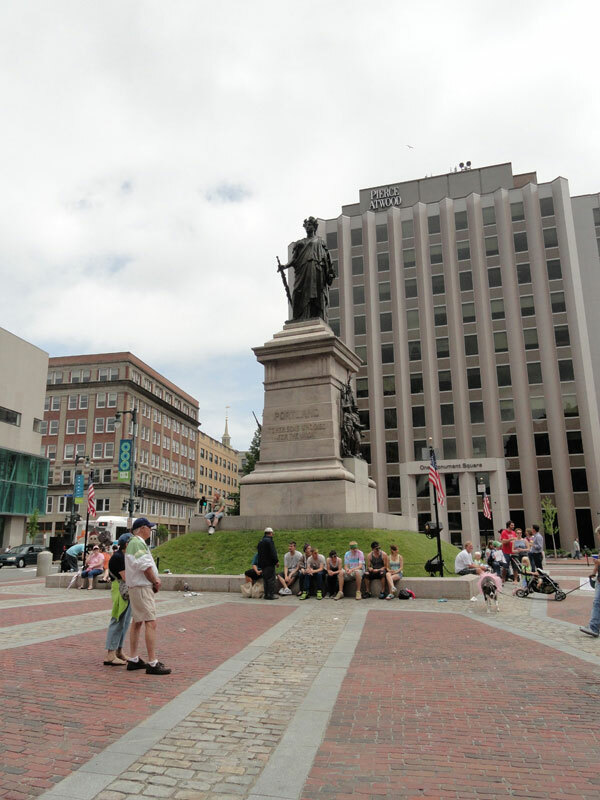 Portland's famous public art honoring civil war soldiers and sailors is located in the square's center. In recent years, the City of Portland has prioritized the preservation and renovation of significant architectural buildings along Congress Street, creating its distinctive character. Portland City Hall. Photo by Flickr user Jimmy Emerson, DVM (CC BY-NC-ND 2.0). Monument Square. Photo by Flickr user Sam T (CC BY-NC-ND 2.0).